A drab hallway, an empty lawn, an awkward nook – every university has them. But what if these were re-imagined as a colourful study space with bench seating, a pop-up outdoor classroom, and a busking area for student musicians? On April 10, a group of about 25 students, staff, faculty and alumni came together to explore McGill’s existing downtown lower campus and to re-imagine some of the everyday spaces that surround us. 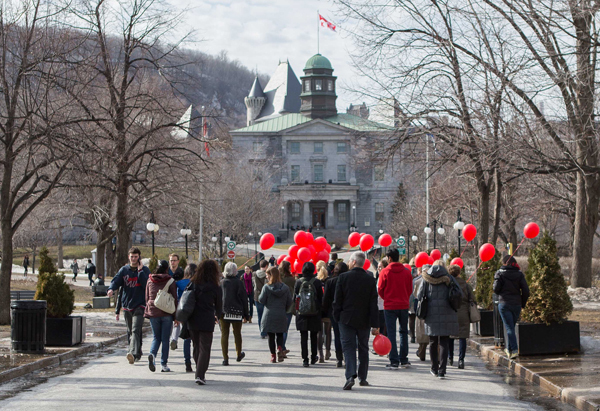 Armed with their red balloons, participants of the first-ever James McGill Walk set off to rediscover and rethink the University’s lower campus. A drab hallway, an empty lawn, an awkward nook – every university has them. But what if these were re-imagined as a colourful study space with bench seating, a pop-up outdoor classroom, and a busking area for student musicians? On April 10, from 4 p.m.-5:30 p.m., a group of about 25 students, staff, faculty and alumni came together to explore McGill’s existing downtown lower campus and to reimagine some of the everyday spaces that surround us. They came for McGill’s first ever James’ Walk, hosted by the student-led McGill Spaces Project. For their official launch event – a James’ Walk – the McGill Spaces Project wanted to bring members of the McGill community together to explore McGill’s campus and its nooks and crannies while also getting to know one another. The James’ Walk, named after James McGill, was modeled on the idea of Jane’s Walks, where community members get together to explore local neighbourhoods and share stories along the way. Jane’s Walks honour the legacy of famed urban planner Jane Jacobs, who championed a community-based approach to city building. “We want hoping to bring together people from different backgrounds who might have insights on things like art, history, architecture, etc., to talk about the influence that different spaces have on their quality-of-life and their day to day experience here at McGill,” says Méthot. The walk started at the James McGill statue on the lower field, and ended at the new outdoor ping pong table near the Leacock Building. Stops along the way included the Founder’s Elm, the exterior of the Redpath Museum, the Arts Atrium, the new ECOLE headquarters, the Roddick Gates, and many more. At each stop, the group shared stories and heard from a variety of speakers, ranging from Peter McNally (McGill’s historian), Méthot, Brian Karasick (from Campus & Space Planning), Carlo Primiani (from Santropol Roulant), Alan Chen (from ECOLE) and Ingrid Birker (from the Redpath Museum), among others. Participants were happy to get to know a little more about the everyday spaces that surround them, and were excited about all the ways – little or big – that we could cooperate to make these spaces even better. The walk would have been hard to miss, in part because participants were given red helium balloons and asked to place their balloons (held down by rocks) at spots they felt “could use some love.” As red balloons began to pop up around campus, it became clear that there really is a ton of potential to transform spaces at McGill, and that community members have a ton of ideas. To get involved, feel free to contact the people at the McGill Spaces Project group as they are always looking for new and diverse collaborators.